Philadelphia, Pennsylvania is home to today’s “Museum of the Day” – the Mütter Museum, one of the most unusual and surprising museums that is part of the College of Physicians of Philadelphia. 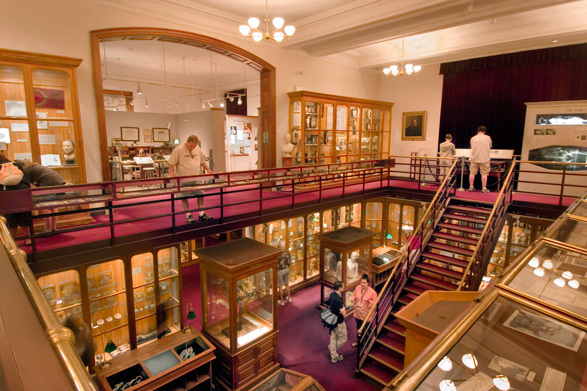 America’s finest museum of medical history, the Mütter displays its beautifully preserved collections of anatomical specimens, models, and medical instruments in a 19th century “cabinet museum” setting. The goal of the Museum is to help the public understand the mysteries and beauty of the human body while appreciating the history of diagnosis and treatment of disease. The Collection began as a donation from Dr. Thomas Dent Mütter, who was determined to improve and reform medical education. The donation stipulated that the College had to hire a Curator, maintain and expand the collection, fund annual lectures and erect a brick building to house the collection. Since 1858, the College has held true to its promise to Dr. Mütter. Today the museum enjoys steadily rising international popularity, including a recent documentary on the Discovery Channel and two best-selling books. I love the museum and will definitely make a trip to Philadelphia to see this one again, and to take in all the cultural organizations in one of my favorite cities in the United States. I’ve been there the museum is great ! They organized a display with books from fairytales by the Grimm brothers. They showed that the physical descriptions in the tales were inspired by true medicine facts. Really interesting !